Your laptop power is failing, your bladder is stretched, a slab of ice cold air is falling straight on to the back of your neck. One solution is the patented Coté method. Michael long ago realised the best approach was simply to stay in your hotel room and watch the conference keynote from there. Have some breakfast, have some comfort, maybe have a quick break for a shower after 2 hours or so. Sometimes the hotel networks or the streaming doesn’t work properly, which can mess things up. And then of course there is a fundamental mismatch in expectations. If you are press, media or an analyst the marketing people want you at the keynote. You are meat in the room. That’s what they invited you for. That’s what they’re being measured on. That’s why they paid for your travel and expenses, damn it! Beware the dreaded: “Didn’t see you at the keynote”. Meanwhile you’re attending the conference largely for one-to-one meetings, for the hallway track, for the social interactions, for the smaller more intimate conference sessions that more closely meet your interests. Major vendor keynotes are generally driven by internal politics and money. Every group in the company wants a spot for their product or service. Keynotes are defined by weeks or months of dogfights by senior executives to have their announcement included in the Main Event. Smart teams now vie for weird day zero slots where they can make an impact –take for example AWS Sumerian, the AR/VR development platform, launching at midnight the night before Re:Invent 2017 kicked off. There are exceptions of course – for a time Apple keynotes were so slick and on point they perfectly reflected the products and were like watching a really good, if somewhat mannered, piece of performance theatre. “Practically magical”. But Apple didn’t optimize for meat in the room – the online conversation, Apple stans wetting their pants, was everything. Walt Mossberg had been pre-briefed. 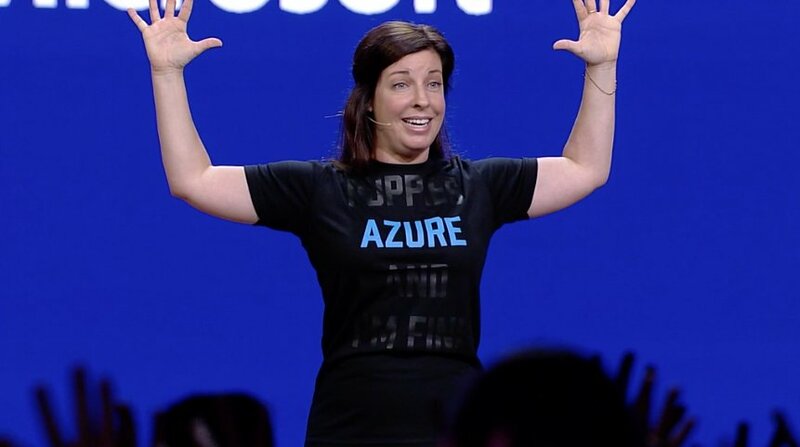 Which brings me to Microsoft Build 2018. I wanted to talk about a lovely moment during the keynote on day one. About half way through they introduced Allison Krug, one of the Azure Avengers, to take us through some stretches. My first reaction was somewhat British – would you please run that by me again? It’s a keynote, not a yoga retreat. But then why not? I was next to the aisle so I had plenty of room to stand and stretch. And it was great. Stand tall, breathe in deeply, spread your arms out. And then, Alison said about a stretch: “this is the best one”. And it was. I had forgotten it. In my late 20s I had repetitive strain injury but managed to get it under control with quite a bit of physiotherapy and significant changes to my working posture. The RSI hasn’t bothered me for years. Lately though I’ve been having a nagging pain in the muscles on my chest. Not in a worrying way, just an annoyance. But I had forgotten the exercises. it’s been on my to do list to visit a physiotherapist for a refresher course. And here I was, in a Microsoft keynote, being reminded of the exercises that would get rid of the pain. Thanks Alison!!! My only complaint – if you have stretches on day one, you have to have them on day two as well. I believe it was also Alison that arranged the petting zoo in the exhibition hall. That’s right – a petting zoo with dogs, mini ponies and bunnies at a tech conference. It was a really nice touch – attendees were loving it – nice enough I saw people who weren’t at the conference saying they wish they were. The Azure Avengers definitely brought a different vibe to Build. It’s important to remember that big events can be stressful for people. Petting animals can really help reduce that stress. While writing this post I remembered an excellent talk during Marco Abis’ excellent Operability 2016 conference in London where Scott Klein, cofounder of Statuspage.io, took the room through a set of mindfulness exercises before kicking off his talk. It worked really well, even with a crowd of British people. In conclusion – more, and less please. More stretches. More thought given to attendee comfort. Accessibility. Inclusion. Self-care. Fewer announcements though, and shorter keynotes. A keynote shouldn’t feel like something you have to endure. The truth is nobody is going to remember anything much after the first hour anyway. Not without stretching breaks anyway. At RedMonk conferences we generally aim to have plenty of breaks (though sometimes I do get excited and schedule too many talks). More breaks and shorter sessions makes it a lot easier to give the speaker your full attention, which is really what tech talks are about, isn’t it? While I realise we’re not going to see major tech conference keynotes that are only an hour long, it would be great to see more thought given to the attendee’s comfort. If your new service or product is compelling, it will find the people that matter. disclosure: Microsoft is a client, but this piece is independent analysis and is not commissioned. Fortunately there are some fallbacks such as “Great point on the impact of AI…..” Thankfully an event hashtag can help but that’s the hotel keynote downside for sure. You’re right that the real reason we (media/analyst/punditry) are there is for 1:1s, digging into customer and developer sessions and getting the skinny on the ground. I’m game for keynotes but not for sleep deprivation. Start your keynote at 8am and I’m watching from my room….